Sticking to my local birding sites; today, I started the day by birding Forest Park. My first visit was at Stracker Pond around 7:50 am, where I picked up about 10 species including a very cooperative Green Heron. I spent a little longer there than expected, as I met a group that was on an Audubon/Urban Park Rangers bird walk. I stuck around and helped out a bit in pointing out a few birds and sharing views in my scope. After about an hour, the group left heading to the Water Hole another bird spot in the park; since the Waterhole, was in the plans for the day, I headed out there myself on my own. The Waterhole was very quiet, which I kind of expected. Activity around the water hole is dependent on water and with the hole pretty dried up there was not much happening. To help the water situation, many local birders have been carrying water in various containers and filling up a garbage pail cover, as well as a dripper. That works, but it does not bring in the numbers that a good rainfall would accomplish in filling the hole with water. Nevertheless, I picked up a few more species including a Northern Parula. I then headed out to Jamaica Bay Wildlife Refuge. I was not keen on walking the trail because it was getting towards noon and I usually like to have covered that area much earlier. 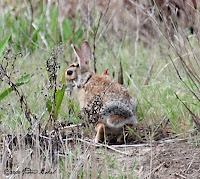 However, once there I continued on and found several additional species. My last stop was Big Egg Marsh and I did not do a good job calculating the tide as I hit the spot when the tide was receding and that was not good in terms of being able to see birds closer to the shore. It was not a bad day, and even though I did not bird the gardens nor the East Pond at JBWR, I still ended up with a total of 56 species. On Sunday, I had planned on helping my friend Don Riepe, who was leading a walk with the Friends of the East Brunswick Environmental Commission, at Jamaica Bay Wildlife Refuge in Queens NY. The walk was scheduled to begin around 10:00 am. 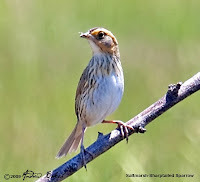 However, 10:00 am is kind of late and so I got out to the refuge around 7:45 AM and birded the South and North Gardens. The South garden had my best find of the morning as a Black Billed Cuckoo flew in and perched on one of the Pin Oaks in the garden, proving it pays to be early. 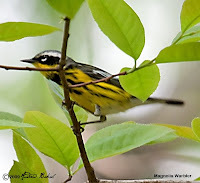 Other birds moving around included, Magnolia Warblers, A Canada Warbler, Black-throated Green Warblers, Blackpoll Warblers and Northern Parulas. Along the trail to the North garden, I found a Male Scarlet Tanager, Blue Headed Vireo and Red-eyed Vireo. In the North garden itself was another nice find in a Male Cerulean Warbler, the first of the year in that location. Bay-breasted Warbler also made a show as well as several Yellow Warblers. By then it was almost 10:00 Am and so I returned to the visitor's center, where I met with Don and the folks from "Friends of East Brunswick Environmental Commission". We began our walk with a brief look around the visitor's center, then headed out along the West Pond trail. 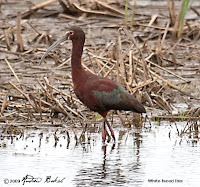 The West Pond had the usual assortment of birds with Ruddy Ducks, Glossy Ibis, Laughing Gulls, Canada Geese and Mute Swans all scattered around the pond. Along Terrapin Trail, we found some shorebirds, consisting of a mixture of Semipalmated Sandpipers, Black Bellied-plovers and Dunlins. We also found a Horse Shoe crab that was entangled in rope/twine. Don retrieved the poor fella and we worked together in removing the obstruction; I am sure that horseshoe crab was grateful to us for the rescue. Further along in the North Garden, we missed the Cerulean and Bay-breasted, but picked up a Rub-throated Hummingbird and a Scarlet Tanager...probably the same one I had seen earlier. Later on over at the East Pond, Don did another rescue...venturing out just off the East Pond shore to retrieve a Silk Moth from the pond. Truly Don continues to earn the title "Jamaica Bay Guardian". 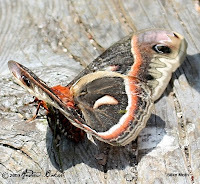 The moth appeared in poor shape; however it looked better after a few minutesin the sun, we all hoped that it made it. Overall, it turned out to be a decent walk, we saw many birds and the group got to see two rescues...not bad for a Sunday Wildlife walk. Today, I drove up to Doodletown to do some birding and met up with the Queens County Bird Club. I got to the location around 7:15 AM, which was good time, as I wanted to get an early start. 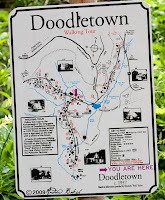 Doodletown, used to be a town of Stony Point Rockland County, New York. It was purchased by the Palisades Interstate Park Commission during the 1960s and is now part of Bear Mountain State Park. It has become a popular destination for hikers, birdwatchers, botanists, and local historians. While Ian Resnick and Arie Gilbert the leaders of the walk waited for their club members and others, I began the trek up the hill with another birder. 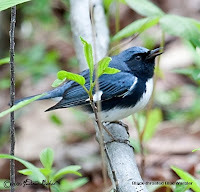 We quickly located a couple of key birds, a male Cerulean warbler, Hooded warbler, and a Blackburnian warbler. Wow! Was all I could think of…if this was the start what else might be in store. 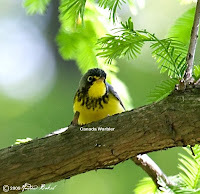 On Lemmon Road, we heard the Kentucky Warbler as soon as we started up the road and found other birders looking for the bird. No one really got to see the bird, but we heard it quite well. Reluctantly, we moved on; around the water tank/tower we had nice looks at a cooperative Blue-winged Warbler. On the way back down, Lemmon Road, some of us including myself had a brief glimpse of a Pileated Woodpecker, which is always a thrill to find. 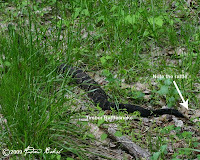 We visited some of the other trails and found one of the neatest find of the day in a Timber Rattlesnake. After a short lunch break, we headed back to our vehicles and drove first to Iona Island Marsh and then to Mine Road. 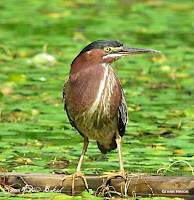 At Iona we had looks at a Green Heron and another or the same Pileated Woodpecker. Over at Mine Road, we found another target bird in Golden Winged Warbler. Later on we picked up Cliff Swallow and Prairie Warbler around Katonah Reservoir. Around 4:30 PM, I called it a day and headed back to Queens NY. It was a good day of birding with several highlights. One of my most interesting observation was first listening and then in surprise watching a Cerulean Warbler sing a Hooded Warbler song. As if birding is not hard enough, that episode makes it harder to bird by ear. Total birds seen: 62 - One Timber Rattlesnake, 3 Tiger Swallowtail Butterflies and a Tiger Beetle. A morning walk at Jamaica Bay Wildlife Refuge in Queens NY to do some shorebird monitoring and photography, resulted in very exciting news...at least it was for me. I found well over 300 Red Knots feeding out on the mudflats with many other shorebirds. 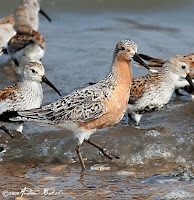 The species recorded and counted include the following: Red Knots (300+), Rudy Turnstones (100+), Semipalmated Sandpipers (100+), Least Sandpipers (20+), Semipalmated Plovers (100+), Black-bellied Plovers (50+) and Short-billed Dowitchers (10). Those of you who know the "Plight of the Red Knots", would understand my exuberance at seeing Red Knots outnumbering the other shorebirds. If you are interested in understanding the situation with the Red Knots, I recommend you look at the documentary "Crash: A Tale of Two Species". After the Oceanside visit, I decided to make a late afternoon run over to Big Egg Marsh in Queens NY, to do some Shorebird monitoring. I have been doing the shorebird monitoring as part of my contribution to the IWASH (Improving Wetland Accessibility for Shorebirds and Horseshoe crabs) project for NYC Audubon. My observation took place from 5:45 PM to 7:45 PM. During that time I recorded and counted the following species: Willet (20), Semiplamated Sandpiper (50+), Least Sandpiper (8), Semipalmated Plovers (6), Killdeer (2), Oystercatcher (1) and Ruddy Turnstones (100 +). After resting from the Delmarva trip, I had the itch to get out and I made a long overdue trip to the Marine Nature Area in Oceanside NY. I was late in getting there and arrived well after 10:00 AM; after chatting a bit with Assistant Biologist Kim Fessler, I headed out to walk the loop. The sun was out in full force and it made for a nice walk, though I would have preferred it to be a little cooler. 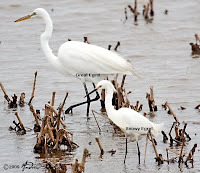 Among the species, noted included Short-billled Dowitcher, Green Heron, Snowy and Great Egrets, Forster's Tern, Semipalmated Sandpiper, Semipalmated Plover, Nesting Ospreys, Song Sparrow, Yellow-crowned Night-Heron, Willet, and Saltmarsh Sharp-tailed Sparrow. Unfortunately, the Black Necked Stilt was not around and has probably moved on or was not there when I visited. No flycatchers seen so they may not be around as yet, or I could have missed them. Kim did indicate and showed me photos of a Ruby Throat Hummingbird that was seen visiting the feeders, so they are around, but I had none that day. On Tuesday, I arranged my schedule to join my friends Doris and Don in doing some planting at the Jamaica Bay Wildlife Refuge. Doris and I got started by planting a couple of Beach Plums behind the visitor's center. 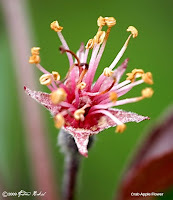 While planting the Beach Plums, I reviewed some plants that I had put into the ground in the same area. The plants included, several Virgina Roses and a Hackberry sapling; they all appeared to be doing quite well and I was very happy at the success. 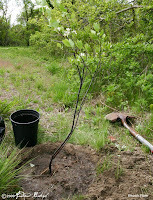 Once Don got back from wherever he went (probably skylarking somewhere:)), we headed out to plant Amelanchier Canadensis along the BLVD. We ended up planting about 14 plants and also did some Bittersweet removal. While we were planting we did some analysis on a few areas where the invasives were wreaking havoc on many of the native plants. We discussed organizing a day of invasive removal. Not sure when this will happen, but I fully expect a follow-up conversation and an action plan shortly. We will probably concentrate on removing the Oriental Bittersweet that is taking over several of the Cedars. Stay tuned for "Operation Take Back Jamaica Bay"...or something like that. Following yesterday’s Birding Big Day event with the Urban Park Rangers, I went to Central park to bird with Joe Giunta who had a Spring Migrant class trip. 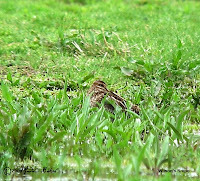 The weather was not the best for birding as it was too windy and bird activity was minimal. Our walk took us through many good birding spots in the park, starting with Strawberry Fields, which turned out to be the best spot for the day. 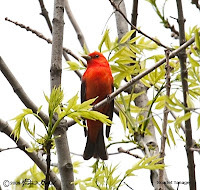 Here we had good looks at Scarlet Tanager, Indigo Bunting, Black Throated Blue, Baltimore Oriole, Ruby-throated Hummingbird and a Canada Warbler that gave us spectacular looks. Other highlights of the day included a Yellow-billed Cuckoo and Warbling Vireo that were called in with phishing sounds by Birding Bob who was leading another group. The best highlight for many as well as a life bird for some who were lucky to have seen it was a Wilson’s warbler that I spotted just before we got to Oak Bridge. Another good bird that we heard about was a Prothonotary warbler seen at the point, but when we got there the crowd was just too much and we did not stay there too long. At the end of the day, I had a total of 42 species. Yesterday, I went out with the Urban Park Rangers on a Brooklyn, Queens Birding Big Day event. I got to the meeting place, the Woolman Rink in Prospect Park around 7:30 am and birded a bit picking up a couple of species before the group started gathering around 8:00; by 8:30, we were all boarded up and heading out to the first stop in Prospect Park. In all, we covered a total of 6 sites…well I should say 7 for me since I was up at 5:00 AM restocking the feeders in the garden and doing a bit of backyard birding. 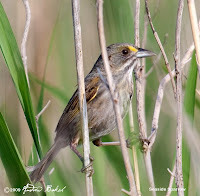 The locations birded were Prospect Park, Forest Park, Alley Pond, Rockaway Beach, Salt Marsh Nature Center in Brooklyn and Drier Hofferman. The group seemed to be a bunch with different levels of birding experience, with some better than others; for the most part everyone seemed to be helping each other finding species, though we did get the occasional “you are blocking me” comment. One that I always find amusing especially, if it comes from someone who parks themselves behind another birder and then attempt to look for a species. 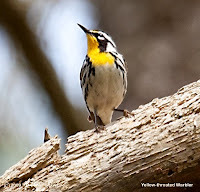 The toughest spot might have been Forest Park for some, as it was not easy finding warblers high in the canopy. Coincidentally, it was this location that I had my best birding, finding, Chestnut-sided Warbler, Magnolia Warbler, Blackburnian Warbler, Canada Warbler and the highlight and life bird for some in Bay-breasted Warbler. I also had 4 species of vireo. 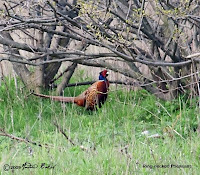 At Rockaway beach, the group had nice looks of a Ring-necked Pheasant and many were pleased at seeing this bird as well as the nesting Plovers. Towards the end of the day, I had a nice surprise at Drier Offerman in finding a Prairie Warbler. There was also a reported sighting of an Orchard Oriole at this location, but I did not see it, so it did not make my list of 101 species. After about 10 hours of birding we returned to Prospect Park and departed. The rangers did an excellent job and my thanks to Anthony, Tom and Jerry for a fantastic job. It is not easy driving around a bunch of demanding birders. 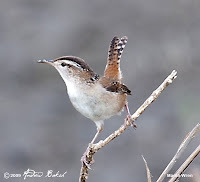 My friend Don Riepe and I had discussed last night about the possible fall out of spring migrants that might occur after the recent steady bout of bad weather and we planned on checking out JBWR. Today, at around 8:45 AM Don called me to let me know that he was at the refuge. Ten minutes, later I pulled into the parking lot and after letting Don know that I was onsite, I headed straight for the South garden. The garden was alive with the sounds of warblers all around. The familiar tzee-tzee-tzee-tzeeeo alerted me to the presence of American Redstart and it was not long before I found one, then two and more. Black-throated Blue warblers were singing their zur-zur-zur-zree and I knew that it was going to be an interesting morning at the refuge. I met some other birders from Rockland Audubon and one of them called out a Tennessee warbler, which was a good find. 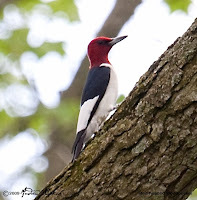 By then, Don had worked his way back to the South gardens and alerted me to the sound of a Black-billed Cuckoo, whose sound of ku-ku-ku could be heard amidst the din from all the other birds. Don decided to bird the edge of the gardens to get the light behind him in the hopes of good photographs, while I decided to focus more on finding out what had arrived and so I worked my way inside the South to the North garden. Along the way, I picked up several more bird including another new arrival in Chestnut-sided warbler. Don and I met around the North garden and we picked up Magnolia warblers and Scarlet Tanagers. I decided against making the loop and turned back with Don and walked the trail back towards the visitor’s center. Along the way, we met another birder who had found a Cape May warbler…another good find. 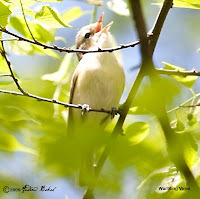 We found a Ruby-throated hummingbird and heard the Yellow-billed cuckoo before we got back the center. Here I parted ways with Don as I headed across to the East Pond. Over by Big John’s I saw many of the same warblers that we had found in the gardens and also picked a few notable additions in Green Heron and Baltimore Orioles. With southerly winds tonight, we possibly could see more arrivals tomorrow. A late evening stop by the Water Hole in Forest Park Queens, did not result in much…though I did get my FOS Kingbird. After seeing the new spring arrivals in the backyard (see my "Backyard Birding News" post earlier today), I decided to visit one of the sites that I am covering for the IWASH (which stands for Improving Wetland Accessibility for Shorebirds and Horseshoe crabs.) research. Today, I went to Big Egg Marsh, in Jamaica Bay Queens. I got there late...around 12:15 PM and birded for an hour or so. In that time, I picked up Lesser Yellowlegs, Greater Yellowlegs, Willets, Semipalmated Sandpipers, Savannah Sparrow, Glossy Ibis, Brandt, Laughing Gull, Great Black-backed Gull, Red winged Blackbird and a Wilson's Snipe, which was the highlight. With the obvious movement of birds coming in, it bodes well for the Big Birding Event that will be taking place this weekend. I have been waiting patiently for one of those spectacular spring backyard birding days and this morning...just a few minutes ago, I had one. A Yellow Breasted Chat, a Male Scarlet Tanager, 2 Northern Parulas, a Male American Redstart, Ovenbird a Veery and a Wood Thrush were observed in the backyard. This suggests that more migrants came through last night. Outstanding!!! Now, all I need are some photos. 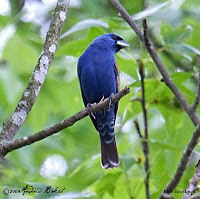 Rain over the past few days, has put a damper on my birding activities. A break from the rain today allowed me to arrange my schedule to bird the West Pond and North and South Gardens at Jamaica Bay Wildlife Refuge. Arriving at the refuge around 9:45 AM, I started in the South Garden working my way towards the North Garden. In the South Garden, there were a number of Black-throated Green Warblers moving around along with a lone female Rose breasted Grosbeak. 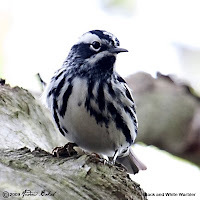 In the North Garden, things picked up with Blue-headed Vireos, White-eyed Vireos, Black-throated Green Warblers, one Blue-winged Warbler, Yellow Warblers, a single Northern Parula, and a new arrival in Blackburnian Warblers (3-4). On the West Pond Trail out on the mudflats in Pumpkin Channel, there were new shorebird arrivals. 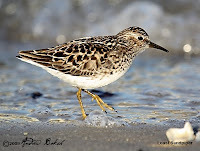 Observed were Dunlins (estimated about 50 +), Black-bellied Plovers (14), Ruddy Turnstone (10) and Willet (6). This is a very good sign that birds have moved in during the past few days. If the weather holds up tonight, we could have a good push with even more species arriving for a nice weekend of birding. I will have to watch the weather and see how it plays out the next few days. With rain in the forecast, I decided that I would spend time getting caught up with my yard work. Of course, I had to squeeze in some type of birding; so, instead of heading out to some birding destination, I was sipping my morning cup of coffee and staking out the backyard at around 7:00 AM. 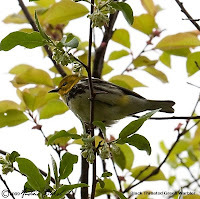 I was not disappointed, as I had new Spring arrivals in the backyard with 4 Rose Breasted Grosbeaks (3 males and one female), my first of the season Ovenbird, a Common Yellowthroat, a couple of Yellow-rumped Warblers and a Summer Tanager. The Yellow Warbler continue to show, along with Brown Thrashers and a Hermit Thrush; a Female Eastern Towhee was also seen..though I did not see or hear the Male that has been hanging in and around the garden. Amidst the on and off drizzle I got some work done. Another good day's work or two and the garden should be in good shape. I had a Jamaica Bay Task Force meeting today at the Wildlife Refuge visitor’s center. Since the meeting was scheduled to begin at 6:30 pm, I decided to get there early and bird the gardens and West Pond. I got to the refuge around 4:50 pm and headed straight for the South garden. Like Wednesday, the garden was quiet with even less activity…which probably had more to do with the time that I was there. Not much other than the sounds of Yellow Warblers and Common Yellowthroat. 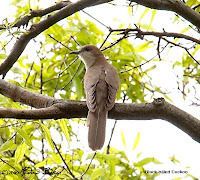 I did get a fleeting glimpse of a Yellow-billed cuckoo in the North Garden, before it disappeared into the canopy and out of my sight. By the time I hit the West Pond trail, the light was fading. Luckily, I had my scope with me and so I was able to scan the pond and shores for any activities. I was a bit surprised at the number of Red-breasted Mergansers on the pond. There were well over 75 hanging out with Ruddy Ducks and Greater Scaup. A lingering Bufflehead was also spotted in the crowd. Notable birds along the trail included Yellow Warblers, Savannah Sparrows, a Vesper Sparrow (missed on getting a photograph), Song Sparrows, Glossy Ibis, Snowy Egret, Great Egret, 2 flyover Killdeer and 4 Willets. 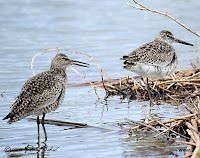 I was pretty interested in the Willets because it was an increase of three from the lone Willet that was sighted last Saturday. In addition, since I am participating in the Shorebird research for IWASH, this was important data to capture.